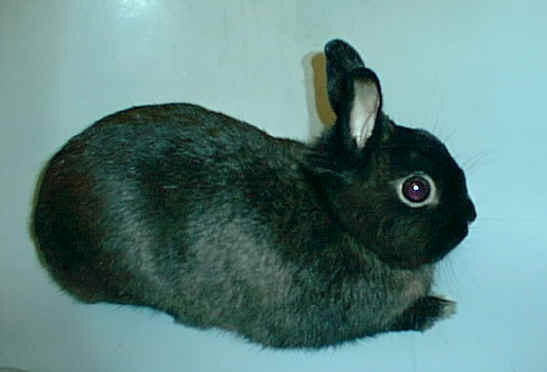 On 1/17/00, I got a call from the vets office that they had someone looking for a home for an 8 ear old dwarf black bunny and could I help them. I took the peoples name and gave them a call. 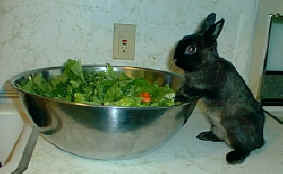 My first question was "Why after 8 years would you want to get rid of your bunny?". They told me they have had this bunny 3 years and their daughter was not taking care of it and it spent all its time sitting in its cage. The previous owners had it for 5 years and got rid of it for the same reason. 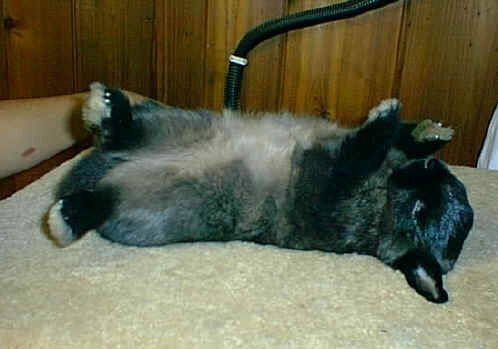 I asked if the bunny was neutered and they said they didn't know. I told these people that the only condition I would take the bunny is that they would have to take it to the vet for a checkup and if it was not neutered, they would need to pay to have it neutered and then I would take him. On Saturday 1/22/00, I met these people at the vets office. 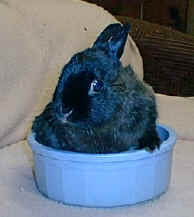 Cocoa was healthy and weighed 2 pounds. We set up his neuter appointment, they paid and I brought Cocoa home with me. He is so cute and is the littlest adult bunny I have ever seen. Cocoa is the tiniest bunny I have and weighs about 2.5 pounds. He is so incredibly sweet and lovable and gets held constantly by my children. Cocoa is the love of my daughter Caitlin's life. She carries him everywhere with her and he just puts up with everything. 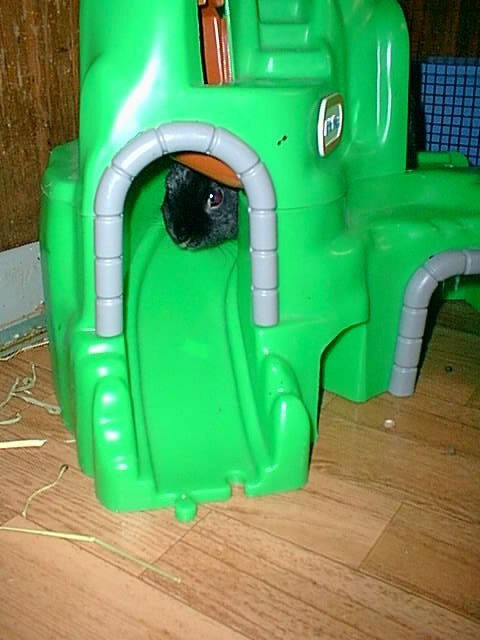 This is Cocoa after he climbed up into the castle and looking at the slide to come down. This is Cocoa at the bottom after coming down the slide. Cocoa has fought a long hard fight with his illness that started when the other bunnies were getting sick from the food that was contaminated with mycotoxins. He has had an ongoing infection that would respond to antibiotics and then come back worse. He started having tremendous difficulty breathing on 1/8/03 and by the morning of 1/9/03, I couldn't bear to listen to him struggling. I had Caitlin come and hold him to say her goodbye's to her beloved bunny and she cried and cried and cried. We took him that day to the vet to release him from his pain. Arielle (her twin) said Caitlin was crying a lot at school and that Caitlin's teacher had the whole class say a special hebrew prayer/psalm today that is for the ill and those dying. This is not a prayer they normally say unless someone is ill but the teacher thought it would help Caitlin to feel better to know that the other kids were saying this with her on behalf of her baby. In Judaism, a life is a life and it doesn't matter if its human or animal because we are all G-d's creatures. 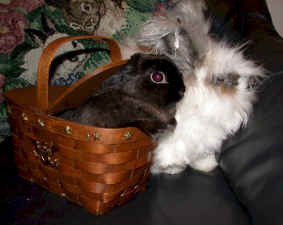 Caitlin adored Cocoa and she would wrap him in a blanket and put him in the basket or wagon or anything else she could find to pull him/carry him around the house. She would watch TV and Cocoa would almost always be in her lap. I don't know how she will get over this. I made an album for Caitlin with pictures of her and Cocoa and she treasure this along with a sympathy card she received from one of my petbunny friends (thanks Melanie). We decided to have Cocoa cremated and will allow Caitlin to keep his ashes. 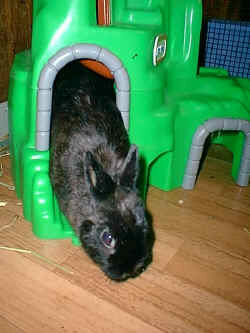 Goodbye sweet Cocoa, you will be forever missed.